FM Approvals has been made aware that Steel Fire Equipment Ltd’s FM Approved Model T-8185NT fire hose is not in compliance with the Lining Adhesion test required per Section 4.5 of Class 2111 Approval Standard for Fire Hose. 1 ½ inch single jacket occupant use hose, polyurethane yarn jacket, polyurethane lined (adhesion material T-8175N) fire hose, 250 psi service pressure. 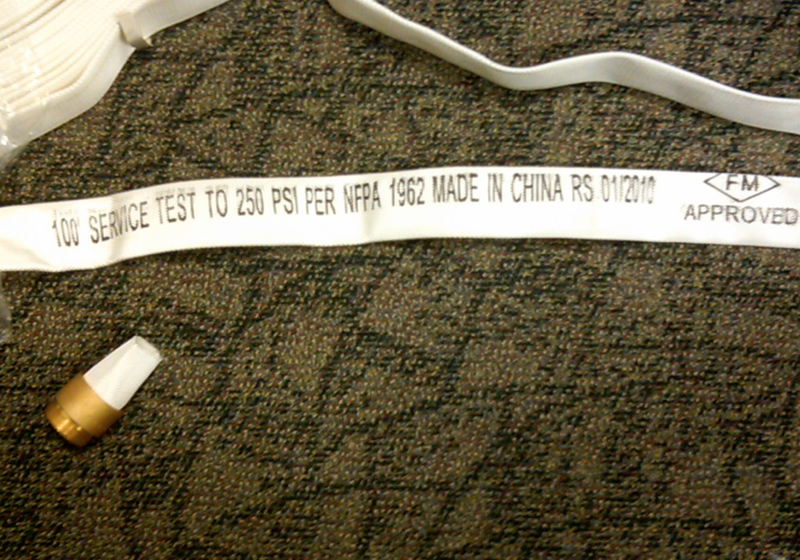 The following information is stenciled on the hose: length, “SERVICE TEST TO 250 PSI PER NFPA 1962,” “MADE IN CHINA,” the manufacturer’s logo “RS,” and the date of manufacture. FM Approvals has conducted Lining Adhesion testing, on samples that were obtained through the open market, in accordance with Section 4.5 of Class 2111 Approval Standard for Fire Hose. Results of this testing revealed that the product is not in compliance with the requirements defined in the standard. The test requirement is that the rate of separation cannot exceed 1 inch per minute. The lining of the Model T-8185NT (part numbers RH50, RH75, and RH100) fire hose pulled completely from the outer jacket demonstrating little adhesive properties. It is evident that the product has changed from what was tested as part of the original Approval project and is no longer in compliance with the requirements outlined in the referenced standard. This product is no longer FM Approved. Figure 1 is a picture of the subject fire hose illustrating the identifying markings.